Do We Need Reminders? – Love. Life. Practice. Do we really need someone to tell us that reading will enrich our lives, or that getting up early in the morning will give us more time to get stuff done? I confess, I might be smarting a bit from the general condemnation travel writer Henry Wismayer laid down on personal development articles. After all, I spend an inordinate amount of time writing these posts, turning them into videos and a podcast, as well as reading up on related topics. And yet I’m a bit of a hypocrite, too: I woke up this morning and spent time checking twitter, reading news articles, and other worthless trivia on my iPad (let’s face it, even though I read through the instructable about a sub-$300 3D printer, I didn’t exactly enrich my life). All the while my yoga mat, thoughtfully put out for me by my partner, mocked me from the floor, and my journal languished unmarked on the side table. Meanwhile I was thumbing through listicles. Hypocrisy, thy name is Gray! It’s a good question, Mr. Wismayer; does the world need yet another webinar on making life more exciting? Are we really helping anyone but ourselves? Doesn’t producing more content like this just give people more of the illusion of self-improvement by reading about it instead of actually doing it, like someone reading about travel rather than actually going out and doing it? Oh, I’m sorry; that was unkind, as Mr. Wismayer is actually a travel writer in most of his work. That was an unfortunate simile. There’s probably a reason people keep reading this. It’s probably not because it’s full of useless platitudes. 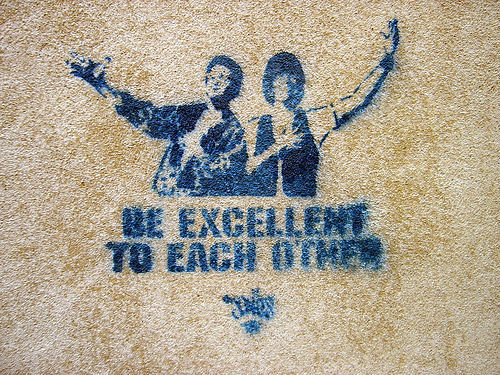 The thing is, there must be some need for people to write the same thing (“Be excellent to each other“) over and over again. Yes, I agree, there is a banality to such platitudes as You always have the option of having no opinion and Learn to concentrate on what those around you are saying. Who doesn’t already know that from kindergarten on? And if you don’t already know that, what are the odds that some particular writer on the internet is going to change your mind? I don’t know; what I do know is that those particular banal platitudes are quotes from Meditations, the journal of Marcus Aurelius, Emperor of Rome. It’s from his journal, and it’s likely that there were a lot of other journals and writers and philosophers during that time. In a timeline of Western philosophers, Seneca and Epictetus are listed along with him as influential. The thing is, Seneca and Epictetus were philosophers by trade. 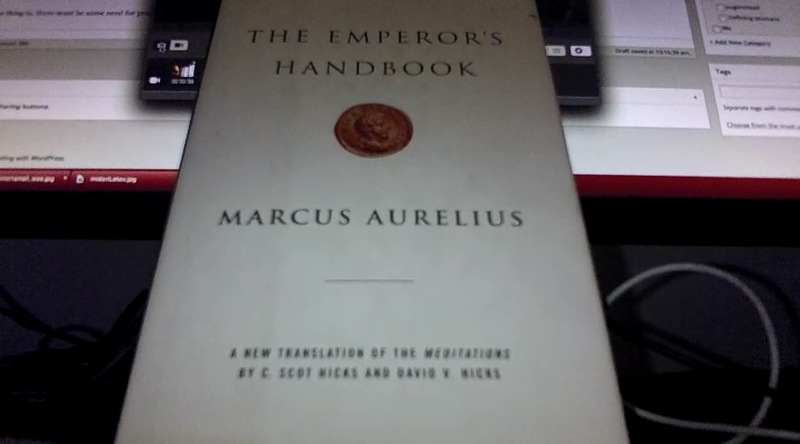 Aurelius was a hobbyist, writing things down in a personal journal, never knowing if anyone would read it. 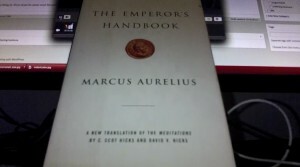 Let’s face it: Marcus Aurelius just kept a blog about his day job (ruling the Roman Empire). What are the odds that, in the decades that he was alive, that those three were the only three people in the Roman Empire writing philosophical treatises? Not very good. In fact, I’m pretty sure that the culture that practically invented the art of rhetoric was about as noisy as today’s interwebs. The reason we don’t have a longer list of philosophers is because the good ones lasted and the ones that were less useful faded into history. At the same time, I am positive there was some Roman critic who was bemoaning the lack of substantive philosophy, and wondering if they were going to drown in the morass of banality. Critics don’t seem to realize that any present they live in is like a big pan of muddy water and gravel just lifted out of a river in the Yukon: it takes some time shaking and stirring and filtering to let the good stuff come out. And no, that’s not the stuff that’s most popular; it’s the stuff that people come back to later on, because they find it useful later. I also believe that those critics – including Mr. Wismayer – are an integral part of the process. They force bloggers like me to take a step back, look at their work, and say Is it really worth it? Am I saying anything worthwhile? Especially when they’re as adroit with a turn of phrase or a well-placed kitten pic as he is, it really does make you want to up your game, if only to insulate from the parts of his critique that hit too close to home. The reason people like me keep writing is not because we are trying for riches or fame or popularity or even some sense of trying to show how smart we are. No, it’s a public reminder to the self, much like the Meditations, thinking about life. Yes, I do make it public, on the off chance it might help someone else who is facing the same issue – but that’s as much a cry for help as an offer of assistance, and more than once someone else’s comments have led me to valuable insights. But hey, that’s just my idea. Stand back – I’m going to try science! Specifically, let’s turn to the work of University College London Philippa Lally and her investigation of the trite idea that a habit only takes 21 days to become solid. Turns out, not so much – it’s much more variable. The range of times to reach a plateau shows that it can take a large number of repetitions for an individual to reach their highest level of automaticity for some behaviours, and therefore creating new habits will require self-control to be maintained for a significant period before the desired behaviours acquire the necessary automaticity to be performed without self-control. 21 days? HA! Some of her subjects took up to 254 days to acquire a habit – and that study was using activities like drink more water. Get that? We can’t even easily create habits with things that we require to stay alive! How is it supposed to be easy to deal with something that’s as fuzzy as “read more”? Read what? What qualifies as more? Does reading over what I’ve written count? Wait, that’s passive, aren’t I supposed be more active? AGH! So yes, I will say the things that other people have said before. I will sometimes even fail in my originality and say it in the same way they did. But that’s ok. Because I eventually put down my iPad, did some shoulder yoga for my stiff arms, meditated for 15 minutes, wrote in my journal, and then listened to a book while I made myself a good breakfast. Habits are not destinations. They are processes. The trick, as any good travel writer will tell you, is to enjoy the journey.